Marshall Pike traffic is being re-routed around construction in the area via Chillicothe Avenue and Bowers Avenue. Construction work on Marshall Pike (SR 124) in Hillsboro is set to resume in two to three weeks, and will continue for another month after that, according to Hillsboro Safety and Service Director Mel McKenzie. 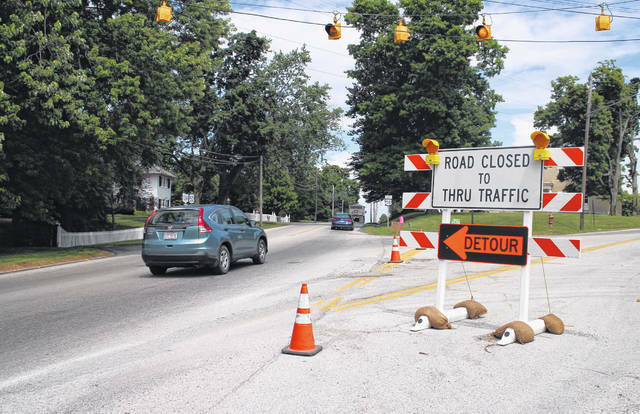 McKenzie said the road was originally closed where Marshall Pike splits off from East Main Street (U.S. Route 50) for an emergency sewer repair. According to McKenzie, a portion of the sewer system collapsed, and crews had to dig up some of the street to make repairs. Coincidentally, a grant-funded utility infrastructure improvement project set for the area fell into place, McKenzie said, and crews are waiting to repave the road until after that project is complete. McKenzie said the upcoming project, funded by a Community Development Block Grant in partnership with Highland County, includes new storm drains, curbs and gutters along Marshall Pike. The safety and service director said the city won the grant last year. Smith Construction of Fayetteville, which won the contract for the project, said work will last about four weeks once the project begins, according to McKenzie. McKenzie said a start date has not yet been set since Smith Construction has a number of projects to complete before it can turn its attention to the work on Marshall Pike. Traffic is being rerouted around the construction via Chillicothe Avenue and Bowers Avenue.